In a sea of Pret a Mangers and Greggs, social enterprise café Social Bite certainly stands out for employing and feeding the homeless. It also makes for an extraordinary cuppa in Scotland. It took George six and a half days to walk here. With 20 quid in his pocket, he left Sunderland, England to look for something more than what the city had offered him: personal tragedy and non-fulfilment, according to George. It is a cold Wednesday morning in October but we sip tea together outside sandwich shop Social Bite, in Edinburgh. As a homeless person, George comes here often, to get tea or a hot meal which a ‘corporate customer’ has pre-paid for. Soon into the conversation, he shakes back his hood to reveal his face, which seems tired, kind and has just enough room for his oddly Disney-like big, blue eyes. Previously an engineer, he now begs for money. He is incredibly chatty and after three roll ups and a tea, he tries to explain the torment he suffers from being a schizophrenic, bi-polar rough sleeper. And I listen more attentively than I have done in a long time. After battles with England’s newest benefit system Universal Credit, his local job centre and LSD, he up and left for the city known for its kinder approach to the homeless. I get us another tea and ask George why I happened to find him here, at Social Bite. He replies: “It makes us feel valued and I feel less vulnerable.” Pause. “The free stuff doesn’t hurt either.” George winks at me playfully. This is one of five Social Bite sandwich shops in Scotland. All profits are donated to homeless charities and of their 100 employees, 25% are formerly homeless. 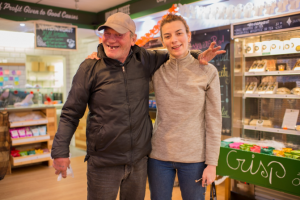 In Social Bite’s five years, they have continued to dedicate large efforts to support the homelessness crisis through employment, support and free food and drink. I meet Mimi, first a volunteer and now the top manager of one of the Edinburgh shops. During our interview, Mimi has to leave the table four times to hug, greet, chat and charmingly ‘walk out’ several customers that she all knows on a first name basis. And despite most of them looking twice as old as Mimi, they seem to lean on and look to her as a mother figure. Mimi tells me how these social enterprise cafes began, “The co-founders of Social Bite, Josh and Alice, would regularly give the local Big Issue seller, Pete Hart, cups of tea.” They had already set up Social Bite with its utopian ethos when Hart asked the couple for a job and they gave him one. “Pete now works at the central kitchen.” Mimi smiles and points to Pete’s picture, which hangs proudly on the wall; the leader of the neighbouring crooked smiles in chef uniforms. Josh and Alice ran into many challenges in the start up of the cafés, but have challenged these to become part of Social Bite’s thoughtful structure. It is illegal for cafes to give out free food, so they decided to create a charity, in order to use the food waste that was left each day. Surely enough, at 3pm, they distribute leftover food to anyone in need, for free. Mimi mentions other challenges they have faced and used to their advantage: “It used to be really straightforward: if you were homeless or on the verge, you could have a job at Social Bite. Now, because the charity is funded by the big lottery and sponsors, we need to have other criteria. We now have three, which are homelessness, addiction and learning disabilities.” This has allowed employee Mateo, who is deaf, mute and autistic, to work in the central kitchen, where he was given the opportunity to work once a week with a Michelin star chef in Edinburgh. I notice that the café appears to be heavily male dominated in its customers this morning. I ask Mimi about any female-focused initiatives and with that, her face lights up. “Wednesday, we do the ladies night which is busy at the moment. It used to be busier. It was so much fun, a big chat, a cup of tea, make-up and hair. We opened ladies nights with black curtains so they felt a lot safer and we can give away toiletries, tampons and condoms for the working ladies. 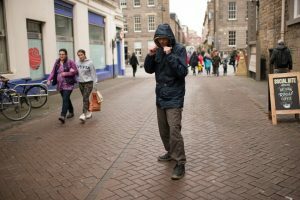 In Edinburgh, the homeless are a small community and they all know each other. [With] your ex husband, you’ll run into someone that knows him and they’ll say to him, I’ve seen your wife..” It occurs to me that there is great deal of emotional support and understanding that the staff pours into their work here. “Would you like to see my karate moves?” George asks, with hopeful eyes. I nod. George proceeds to walk into the centre of the street, filled with tourists and Scots brushing past him. He firmly parts his legs on the ground, pulls his boney arms close to his chest and goes for the kick. He spins, slightly missing the landing and looks at me with an embarrassed giggle. I find myself laughing and for the next few minutes we giggle together. We say our goodbyes and George walks off into the cold with his sleeping bag and rucksack. A minute later, he sprints back. “Poppy, I forgot to tell you about this film I know you would love.” I can see his exhilaration of having a conversation he usually misses out on. We say goodbye again and this time it is real. I am unsure if Social Bite is a sustainable business but it has achieved something greater than that; I leave feeling a strong sense of social justice is needed for George and those like him, and I think Social Bite does too.